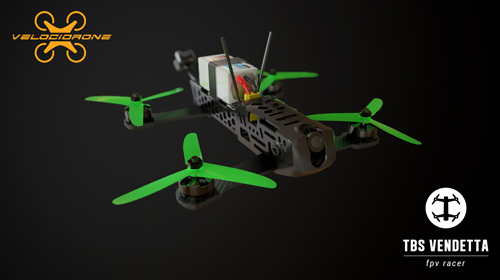 VelociDrone is a fast paced multi-player and single player FPV drone racing simulator. You can select any of 20 real-world racing drones to race through through over 20 professionally, or 100+ community-made maps. You can even design your own maps based on real-life tracks using a variety of gates and barriers. That means you can easily build a map and use it to practice for a race. Our Time attack mode also lets you set the pace and improve with every lap whilst racing against yourself. The VelociDrone development team has achieved the impossible, and made a simulator that integrates BetaFlight to give the most realistic flight experience. This means that if you copy the betaflight settings from your real drone and use them in VelociDrone, it will fly exactly the same. VelociDrone offers the perfect way to keep training your skills without risking your quad. VelociDrone runs on a physics engine that has been perfected over the past two years, and incorporates everything from prop-wash to aerodynamic flutter. When flying, your craft will emulate the exact same flight characteristics as it would in a real flight environment. In version 1.7 of Velocidrone you can now talk to your friends and opponents while you race with them. Enjoy a fun flying session with your pals without worrying about breaking your quad. Compete against other players in multiplayer to improve your lap times and climb the leaderboards. Download the free trial of VelociDrone here. Compatible with Windows, OSX and Linux. Warning: You cannot activate an existing account. After purchasing a license, you will create a new Velocidrone account which will automatically be linked to your Full License. Register and activate your copy of VelociDrone now.